In order to make solidworks more user-friendly, MySolidWorks was launched few days ago. 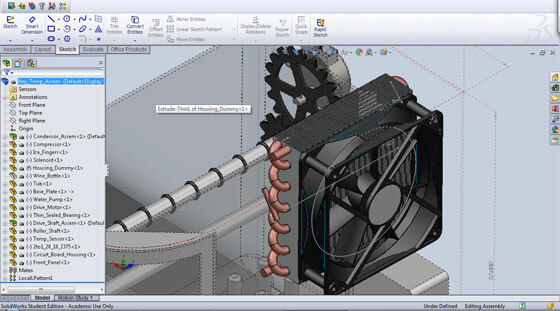 MySolidWorks acts as a wealthy online resource for SolidWorks users with various training modules where one can gather knowledge on a wide array of design subjects as well as get access lots of features and the online forum to participate with questions & answers as well as discussions concerning various aspects of SolidWorks and MySolidWorks. If any project team members face any issues, they can take help from online training content in MySolidWorks and find a instant solution. MySolidWorks consists of a series of CAD models, courses, news, and forums together with cloud storage accounts which can be accessed easily. The platform is segregated into three diverse levels ranging from MySolidWorks, MySolidWorks Standard, and MySolidWorks Professional. Each level is enriched with features, advantages, and capabilities. MySolidWorks Training — The Users can access a massive 120 new training modules as well as study courses for certification containing items like SolidWorks Essentials, Advanced Part Modeling, Sheet Metal Design, Assembly Modeling, and more. MySolidWorks Drive — This feature offers a virtual distribution and collaboration method which facilitates the users to access and work mutually on big designs files with peers, clients, and manufacturers. The users will be able to verify different content designs in the eDrawings online viewer. My Var — A feature that offers a platform for resellers to keep users with forthcoming events and news and new items like webinars, videos, and recent blogs. MySolidWorks Manufacturing Network — The registered manufacturers can access this feature through the ‘Manufacturing Network’ in order that they can communicate with users concerning printing, sheet metal, CNC machining, and injection molding. Join MySolidWorks forum over at 3DPB.com to solve your queries on SOLIDWORKS and MySolidWorks.